La perfezione assoluta. Uno dei miei pezzi migliori ..
Fespam - an ancient Greek city in southern Boeotia, the Athenians founded and named in honor of the Athenian king Fespam. Supporting Athens fespamers actively fought against the hegemony of the capital of Boeotia - Thebes. During the Greco-Persian Wars (500-449 years. BC) residents Fespam refused to teach Persian after the symbol of subordination - land and water. 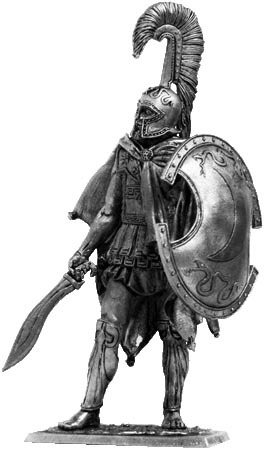 Fespamers seven hundred hoplites under the command of warlord Demofil participated in Thermopylae battle (480 BC), joining the Spartans King Leonidas. They all died heroically. For his part in this battle Fespam was destroyed by the Persians and the inhabitants moved to the Peloponnese. Soon the city was rebuilt and 1800 fespamers soldiers took part in the battle of Plataea (479 BC), where the Persian army suffered a crushing defeat. Hoplite of the elite squad dressed in a tunic and cloak-gown black, which probably represents the willingness to die in battle. Armor-linotoraks also painted black and is reinforced on the right side of metal scales. Large oval shield-shaped cuts on the sides adorned with the symbol Fespam - a white crescent on a black background. Shield of this form is called Boeotia type because it depicted on coins of Boeotia, minted in the 5 th century BC Corinthian type helmet decorated with a high crest of black horsehair. Leggings and hat made of bronze and covered with tin or silver. Sword-kopis has a massive, curved front blade, designed for powerful chopping blows.